Sycoparrotia semidecidua is a semi-evergreen with remarkable flowers. Clusters of small flowers encased in brown bracts form in early spring (January to March). They open to reveal unusual shaped flowers that are orange with reddish tips. Leaves are a shiny, dark green, turning yellow in autumn. Sycoparrotia semidecidua can cope in exposed spots, in full sun or partial shade. It does not need a lot of maintenance, being very hardy and requiring little to no pruning. It grows to approximately 6 metres in height and 4 metres in width. 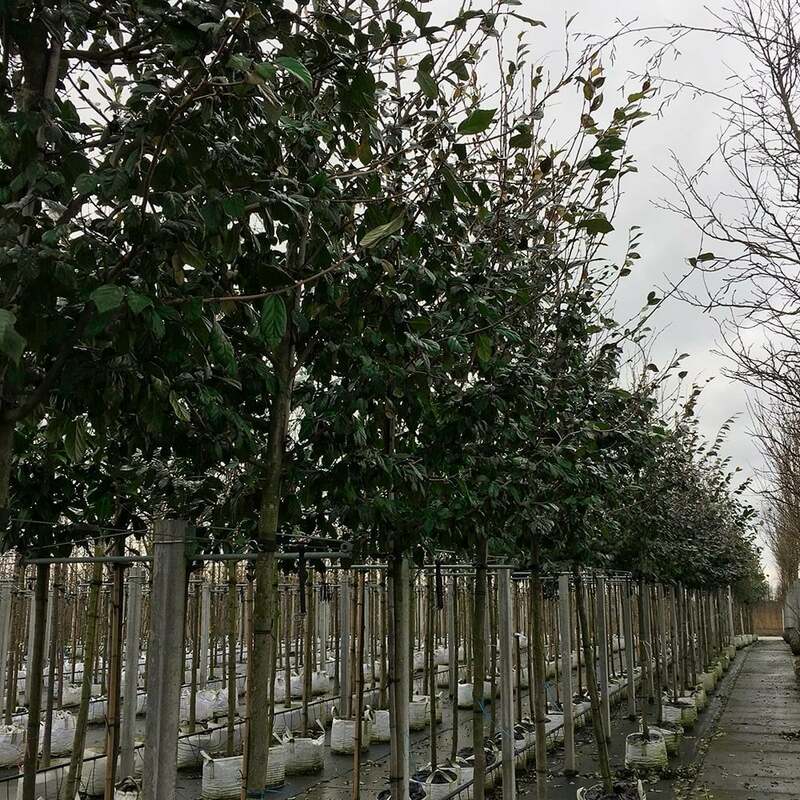 Sycoparrotia is usually grown as a shrub and rarely as a tree, so this is a great opportunity to acquire a splendid example of it in standard tree form. When planting Sycoparrotia semidecidua, it is important to prepare the planting area well. Pot grown Sycoparrotia semidecidua can be planted at any time of the year. You will need to carry out the following to prepare your planting site. Firstly, remove all weeds and grass within a metre of your desired planting hole then dig a hole as deep as your root mass and approximately 2x as wide. We recommend digging a square hole as this encourages the roots to grow straight as opposed to around, inside the hole. To help your tree establish more effectively, we advise applying root grow (sprinkle in the hole for pot grown trees), especially if you have poor soil. Gently loosen the roots and place into the planting hole. We recommend planting any ornamental tree with a stake and tie, to see how to use a tree stake and tie, watch our informational how to videos. Sycoparrotia semidecidua do not require regular pruning and can be spoilt by hard pruning.